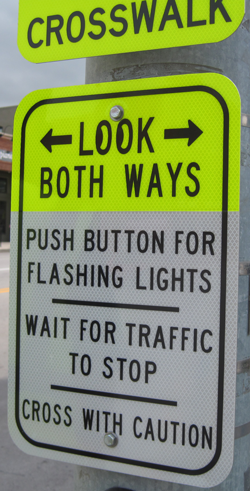 This project provides the City of Des Moines, Iowa with field information relative to pedestrian and motorist compliance when light-emitting diode (LED) pedestrian crossing signs or rectangular rapid-flash beacons (RRFBs) are used at multi-lane roadway crossings. This study is limited in scope to two intersections. The study documented field observations of both pedestrian and motorist reactions. Tabular and graphical comparisons are provided by device type, actuation, location, and time of day. Based on the findings of this study, the City and possibly other communities may be able to make more informed decisions when considering the design, orientation, and operational treatments for pedestrian crossing locations.